To me, as a copywriter who focuses on making sales (not just writing fswancy-schmancy words), I think this was one of the most iconic ads ever. It fits on a single page. It only uses black ink. It sold more than a billion dollars worth of business. It hangs on my wall 35 years after it was published! What an amazing piece of advertising right? By openly sharing their secret sauce, Ogilvy & Mather managed to pull in a billion+ dollars of contracts stemming from this series of advertisements. This single page of 9pt font size text will never win any design awards, but it sure as hell sold a lot of lucrative contracts! I like it because it contains an entire marketing education on a single page. It was written by David Ogilvy and circulated in magazines in 1982. All it does is spell out all the knowledge the Ogilvy & Mather advertising agency has learned throughout the years. In fact it’s 98% information, and only 2% selling. When you GIVE AWAY amazing free information, people tend to BUY MORE from you! Ogilvy & Mather has created over $1,480,000,000 worth of advertising, and spent $4,900,000 tracking the results. Here, with all the dogmatism of brevity, are 38 of the things we have learned. 1.) The most important decision. Should you position SCHWEPPES as a soft drink or as a mixer? Should you position DOVE as a product for dry skin or as a product which gets hands really clean? The results of your campaign depend less on how we write your advertising than on how your product is positioned. It follows that positioning should be decided before the advertising is created. Research can help. Look before you leap. It pays to promise a benefit which is unique and competitive. And the product must deliver the benefit you promise. Most advertising promises nothing. It is doomed to fail in the marketplace, “Promise, large promise, is the soul of an advertisement”-said Samuel Johnson. Every advertisement should contribute to the complex symbol which is the brand image. Ninety-five percent of all advertising is created ad hoc, Most products lack any consistent image from one year to another. Unless your advertising is built on a BIG IDEA it will pass like a ship in the night. It takes a BIG IDEA to jolt the consumer out of his indifference to make him notice your advertising, remember it and take action. Big ideas are usually simple ideas, Said Charles Kettering, the great General Motors inventor: “This problem, when solved, will be simple.” BIG SIMPLE IDEAS are not easy to come by. They require genius-and midnight oil. A truly big one can be continued for twenty years-like our Eyepatch for Hathaway shirts. It pays to give most products an image of quality a first-class ticket. If your advertising looks ugly, consumers will conclude that your product is shoddy, and they will be less likely to buy it. 6.) Don’t be a bore. Nobody was ever bored into buying a product. Yet most advertising is impersonal, detached, cold and dull. It pays to involve the customer. Talk to her like a human being Charm her. Make her hungry. Gether to participate. Start trends-instead of following them. Advertising which follows a fashionable fad, or is imitative, is seldom successful. It pays to innovate, to blaze new trails. But innovation is risky unless you pretest your innovation with consumers. Look before you leap. 8.) Be suspicious of awards. The pursuit of creative awards seduces creative people from the pursuit of sales. We have been unable to establish any correlation whatever between awards and sales. At Ogilvy & Mather we now give an annual award for the campaign which contributes the most to sales. Successful advertising sells the product without drawing attention to itself. It rivets the consumer’s attention on the product. Make the product the hero of your advertising. Any good agency knows how to position products for demographic segments of the market for men, for young children, for farmers in the South, etc. But Ogilvy & Mather has learned that it often pays to position products for psychological segments of the market. Our Mercedes-Benz advertising is positioned to fit nonconformists who scoff at “status symbols” and reject flimflam appeals to snobbery. It is easier to interest the consumer in a product when it is new than at any other point in its life. Many copywriters have a fatal instinct for burying news. This is why most advertising for new products fails to exploit the opportunity that genuine news provides. It pays to launch your new product with a loud BOOM-BOOM. 11.) Go the whole hog. Most advertising campaigns are too complicated. They reflect a long list of marketing objectives. They embrace the divergent views of too many executives. By attempting too many things, they achieve nothing. It pays to boil down your strategy to one simple promise-and go the whole hog in delivering that promise. 12.) Testimonials: Avoid irrelevant celebrities. Testimonial commercials are almost always successful if you make them credible. Either celebrities or real people can be effective. But avoid irrelevant celebrities whose fame has no natural connection with your product or your customers. Irrelevant celebrities steal attention from your product. You set up a problem that the consumer recognizes. Then you show how your product can solve that problem. And you prove the solution. This technique has always been above average in sales results, and it still is. But don’t use it unless you can do so without cheating the consumer isn’t a moron, she is your wife. If they are honest, visual demonstrations are generally effective in the marketplace. It pays to visualize your promise. It saves time. It drives the promise home. It is memorable. These playlets are corny, and most copywriters detest them. But they have sold a lot of merchandise, and are still selling. Make your pictures tell the story. What you show is more important than what you say, Many commercials drown the viewer in a torrent of words. We call that logorrhea (rhymes with diarrhea). We have created some great commercials without words. Commercials using on-camera voice do significantly better than commercials using voice-over. Most commercials use musical backgrounds. However; on the average, musical backgrounds reduce recall of your commercial. Very few creative people accept this. But we never heard of an agency using musical background under a new business presentation. The stand-up pitch can be effective, if it is delivered with straightforward honesty. The average consumer now sees 20,000 commercials a year; poor dear. Most of them slide off her memory like water off a duck’s back. Give your commercials a flourish of singularity, a burr that will stick in the consumer’s mind. One such burr is the MNEMONIC DEVICE, or relevant symbol-like the crowns in our commercials for Imperial Margarine. Less than five percent of television commercials use cartoons or animation. They are less persuasive than live.commercials. The consumer cannot identify herself with the character in the cartoon. And cartoons do not invite belief. However, Carson Roberts, our partners in Los Angeles, tell us that animation can be helpful when you are talking to children. They should know-they have addressed more than six hundred commercials to children. Many commercials which test poorly can be salvaged. The faults revealed by the test can be corrected. We have doubled the effectiveness of a commercial simply by re-editing it. Factual commercials tend to be more effective than emotional commercials. However, Ogilvy & Mather has made some emotional commercials which have been successful in the marketplace. Among these are our campaigns for Maxwell House Coffee and Hershey’s Milk Chocolate. We have found that commercials with an exciting opening hold their audience at a higher level than commercials which begin quietly. On the average, five times as many people read the headline as read the body copy. It follows that, if you don’t sell the production your headline, you have wasted 80 percent of your money. That is why most Ogilvy & Mather headlines include the brand name and the promise. Headlines that promise a benefit sell more than those that don’t. Time after time, we have found that it pays to inject genuine news into headlines. The consumer is always on the lookout for new products, or new improvements in an old product, or new ways to use an old product. Economists-even Russian economists-approve of this.They call it “informative” advertising. So do consumers. Your headline should telegraph what you want to say-in simple language. Readers do not stop to decipher the meaning of obscure headlines. 29.) How many words in a headline? In headline tests conducted with the cooperation of a big department store, it was found that headlines of ten words or longer sold more goods than short headlines. In terms of recall, headlines between eight and ten words are most effective. In mail-order advertising, headlines between six and twelve words get the most coupon returns. In local advertising, it pays to include the name of the city in your headline. When you advertise a product which is consumed only by a special group, it pays to “flag” that group in your headline -MOTHERS BED-WETTERS, GOING TO EUROPE? 32.) Yes, people read long copy. 33.) Story appeal in picture. Ogilvy & Mather has gotten notable results with photographs which suggest a story. The reader glances at the photograph and asks himself,”What goes on here?”Then he reads the copy to find out. Harold Rudolph called this magic element “story appeal.” The more of it you inject into your photograph, the more people look at your advertisement. It is easier said than done. Before and After advertisements are somewhat above average in attention value. Any form of “visualized contrast” seems to work well. Ogilvy & Mather has found that photographs work better than drawings-almost invariably. They attract more readers, generate more appetite appeal, are more believable, are better remembered, pull more coupons, and sell more merchandise. 36.) Use captions to sell. On the average, twice as many people read the captions under photographs as read the body copy. It follows that you should never use a photograph without putting a caption under it; and each caption should be a miniature advertisement for the product-complete with brand name and promise. Ogilvy & Mather has had more success with editorial layouts than with “addy” layouts. Editorial layouts get higher readership than conventional advertisements. Scores of great advertisements have been discarded before they have begun to pay off. Readership can actually increase with repetition-up to five repetitions. These findings apply to most categories of products. But not to all. Ogilvy & Mather has developed a separate and specialized body of knowledge on what makes for success in advertising food products, tourist destinations, proprietary medicines, children’s products and other classifications. But this special information is revealed only to the clients of Ogilvy & Mather. David Ogilvy seemed like a pretty goddamn awesome guy. He’s one of the inspirations for the show Mad Men. He was super vocal about how dumb it was that agencies would make advertisements that would try to win awards….and not focus on making sales. He was a HUGE fan of the direct mail world because of how scientific they were in their marketing vs the not-scientific-at-all advertising agencies of the world. He (accurately) predicted most advertising would start being measured down to the penny. As computers became more prevalent this became truer and truer. Here’s a couple of my favorite Ogilvy quotes. Hopefully you enjoyed this post and learned something! Great piece, thanks for sharing. Where did you ever find a copy of this ad that was a high enough resolution to print and frame?!?! You’re welcome Erik! 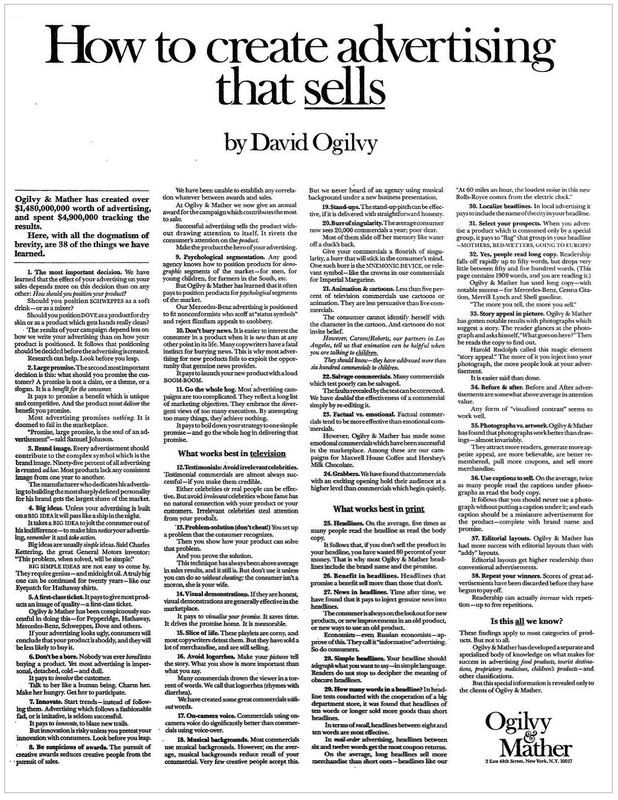 At my last apartment the interior decorators that setup the whole thing knew I loved Ogilvy Ads, and made high res photocopies from my Ogilvy On Advertising book and framed them. Apparently they tried to get them printed online but got some copyright issues, so they went to a local Kinkos and did it! It seems to me, a new copywriter – just graduated AWAI six figure copy-writing – that the only copywriters making money are teaching or writing for other copywriters. Please to share how to get going and make money? It’s like being a freelancer in anything…just because you call yourself a copywriter doesn’t mean the world thinks you have any skills. You have to PROVE yourself to the world by writing lots of articles, by contributing good writing, by working with successful clients, by building your way up. Not true, Chad. But I can understand why you think this. There are plenty of copywriters, including several extremely accomplished and famous copywriters, who don’t write copy anymore. They find it easier to teach young copywriters than to write copy. Plus it can be lucrative for them but now these copywriters are finding it harder to find nascent copywriters willing to spend $500 for an hour of being yelled at and told they’re useless. The best, most consistent, and longest-lasting opportunities still come from actually writing copy for clients who value direct response copywriters. I copied this out by hand a few months back and by the end of it I felt like I learnt a hell of a lot. By reading your stuff, A lot of Halbert, Ogilvy and more I managed to pick up my first gig (not exactly a large pay cheque) by providing the client with loads of information… She hired me straight away. Glad you found it useful and even profited from it!! thanks for taking the time to share this and the other resources too. Always find your content super helpful. Huge fan of Ogilvy and love his book, it’s also one of my favourites. My current fav is Breakthrough Advertising by Eugence Schwartz. You mention Ogilvy on Advertising as one of your 3 favourite books. What are the other two? I have my entire list of 8 or so top copywriting books here. Hope those are helpful Angus! I have been following you, like a fan, not a stalker, for years. That’s for publishing this. Your preach David Ogilvy then Gary Halbert, then Ogilvy and then Halbert. Enjoy your stuff and everybody who you recommend. Now that I understand maybe you have some secret sauce that will make me take action. O wait!. That probably has to be me, doesn’t it? 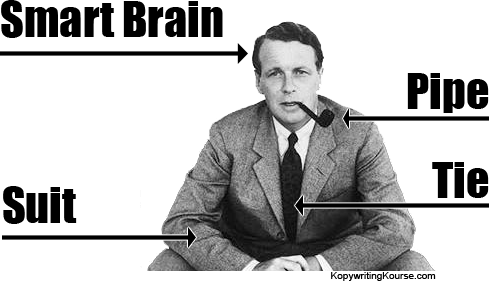 Hey Tim, this is more of a fun homage to David Ogilvy….look through the sidebar of my blog and you’ll find all the how-to articles you’re looking for! Thank you so much for your sharing. I’ve never seen this summary before. Such a great work! The other picture about Ogilvy ads on the wall, could you share? I really want to read more. I was thinking, “I have to rewrite this and print it out, what a bummer”, and then I saw you did that for me. Great stuff. I have that book too, it is great. Here are some small TYPOS I came across reading your article (no offence, just tips)! 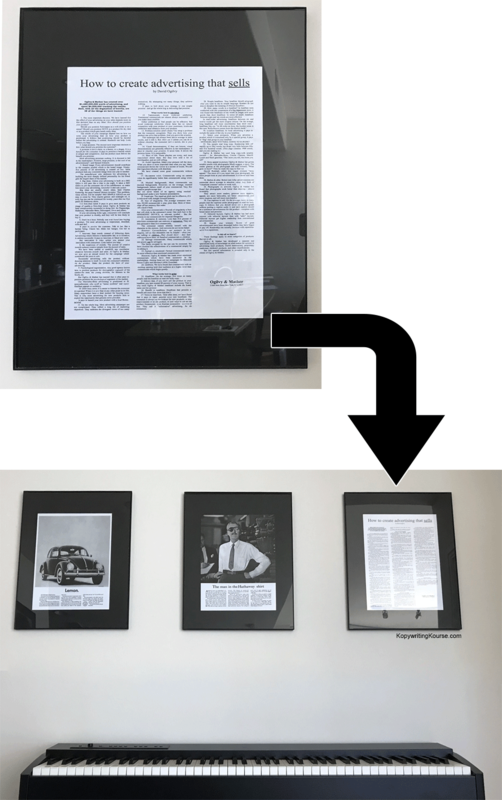 I really would like to have the PDF’s from the VW and Hathaway shirt you have on your wall. Can you provide a Google Docs for these also? One of the best posts!! Thanks Sir Neville!! I want to create a poster of the same thing!! I love inspiration! And you are good at keeping my head in the game! Olgilvy is awesome! I am about to order/read his book about an ad men. As I immerse myself, everyone speaks Olgivly! Keep doing your thang Neville! I’ll follow bro! Great read. Thanks for that. Maybe you could do a post and go over each of these 38 points with examples and further commentary? Just a thought. Hey Pete…..that was originally what this was about, but that would’ve been overkill I think. Thank you John….but isn’t the current image relatively easy to read already? I keep getting an error message when I try to download the files. It’s a Google page that says I can’t download them because it violates their Terms of Service. Am I the only one having this problem? I really really wanted to take a look at these… if anyone wants to share… feel free to email me. Great stuff Neville, thanks so much for sharing Ogilvy’s pearls of wisdom. I know you give away MASSIVE amount of free content, and I thank you for that. hey Nev. I would like to get the kopywriting kourse. do you have a payment plan. something monthly ? Im ready to give you my money…..
You just missed the bundle deal bro! I have a question, How can I get feedback on copywriting ? is there like a website that provides this service ? Well you can get it from Facebook Groups like “The Cult of Copy” and such, but it’s not guaranteed the feedback will be good. Inside my own course we have bi-monthly office hours where you can get feedback directly from me. Neville, I knew you were holding out on us man. This morning read tasted great with my coffee and bean n cheese taco! And I’m in San Antonio – you know we have the best. Glancing at the bookshelf next to my computer I see all the old familiar names — Hopkins, Caples, Ogilvy, Schwab, Collier, Schwartz, Bly — as well as some lesser known or newer ones: Masterson, Lant, Kennedy, Warwick, Cialdini (on persuasion), the AWAI materials, and so forth. All excellent reference books regardless of their age and many of which Neville references in his copywriting materials. Some 40 years ago I used the information I learned from the “classic” copywriters to put together a sales letter. It was a standard package for the time: #10 envelope, four page letter, a lift note, BRE, and a full-page order form with with an additional offer in the P.S. along with a money-back guarantee PLUS 10% if the customer was unhappy for any reason. I mailed it to a small (5K) list to test and waited. A couple of days later I asked an associate to stop by the post office where I’d rented a small box to pick up whatever mail had come in. He came back to me and said the post office wants you to rent a bigger box: he had a entire mail bag full of responses to my mailer. From that one mailing I immediately converted 10% (actually a bit more than 500 orders), and at the moment I can’t recall the conversion rate from the follow-up responses to requests for further information. An incredible 20% of the orders received also bought the offer that was made only at the bottom of the order form in a P.S. My point is that although this was “old school” direct mail, the principles haven’t changed and Neville seems to be repackaging this information in a much more informal and easier-to-use way designed for modern direct response techniques (we didn’t have e-mail, auto responders, and the like back then). This, in my opinion, is a very good and useful thing. I don’t know about the other ones, but Kennedy and Cialdini are Dan Kenney and Robert Cialdini. (also there’s a video at the bottom explaining each). These are amazing and thank you for sharing! You are very welcome Ahmed! I bought Ogilvy on Advertising at a used book store a few months ago and was amazed by the value. Very relevant info in the scope of selling today. Bookmarked this page to reference the other “How To” ads. Thanks Neville! Glad you liked these Roderick! 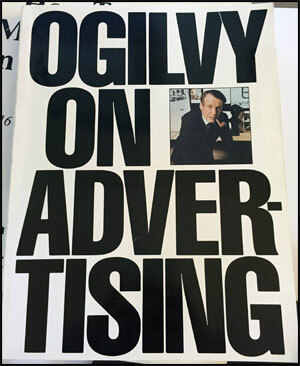 That book is amazing, chock-full of awesome advertisements and great wisdom from Ogilvy himself! Whahoa where has this been all my life? Thank you for sharing these have never seen them before. Love it! Glad you liked Naomi, these ads are super cool and super helpful!